For the more active, a water sports school provides opportunities for sailing, diving, water-skiing and windsurfing. There are also a number of golf courses nearby with the Boavista course only 3km away from the villa. Check our activities page for more info. The narrow streets lead up to a small town full of history, with the remains of a Roman villa and a 17th Century fortress, now a renowned restaurant. A variety of shops are available including Supermarket Baptista which can deliver if required, for a small delivery charge. More information on shopping is available here. There is a Post Office and Bank in the town as well as the Luz Doc medical centre. 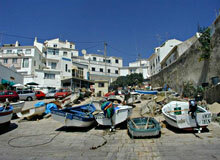 The nearby city of Lagos with it’s fantastic marina and numerous restaurants is a short 10 minute drive from Luz. Another place steeped in history which dates back to Henry The Navigator who had his ships built here for his voyages of discovery. The city is full of atmosphere with it’s tiny shops and places of interest which include a modern auditorium, old city walls, museum and golden chapel. Boats of all sizes can be chartered, boat trips to grottos and dolphin watch can be arranged from here. 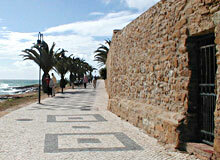 There are plenty of regular buses and taxi services between Lagos and the town of Luz. There is also a rail link from Lagos to Faro. The small friendly village of Burgau is to the West of Luz and lies on the edge of a National Park, ideal for nature lovers and walkers, also the coastal walks offer beautiful views. A small market is held here each day. 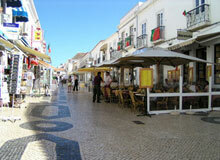 Burgau has a lovely beach which also has a beach bar where you can relax and eat and drink right by the sea. West of Burgau lies Salema, another village with a glorious beach and wonderful beach bar which specialises in fish dishes. There are several other beaches along this coast, many with beach bars. Surfers start from here and move up the Western coast where the waves are quite suitable for them. 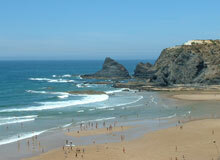 Burgau and Salema are no more than a 15 minute car drive from the villa. You will aslo be able to visit the most Westerly point in Europe, Cape St Vincent. Inland is the town of Monchique located 450 metres above sea level in the mountain range, in the height of Summer, a cooler place to visit ! Cafes, craft shops and art galleries offer visitors things to do and the local restaurants offer the local speciality of chicken piri-piri. In Summer, many places offer free tastings of Medronho, made by distilling fermented fruits of the strawberry tree. Porches is famous for Algarve pottery, here you can see potters at work, painting plates and fruit bowls with sunflowers and grapes. On a visit to Porches you can alo visit the nearby “The Big One” theme park with it’s Raging Rapids, Flying Carpets and Crazy Leap Rides. The park has the longest speed slide in the Algarve. 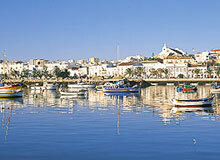 Portimao lies to the East of Luz and is a main fishing port, fishing trips are available from here. River cruises to Silves and trips to explore the local caves and cliffs start from here. 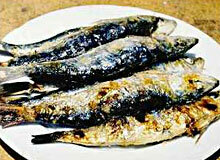 This is one of the best places to enjoy Algarvian seafood, especially sardines. 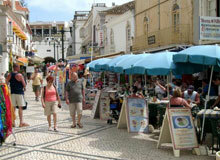 The popular resort of Albufeira lies a little further to the east and is full of boutiques, bars and restaurants, here is the centre of the tourist trade.